Anesthesia- From Life or Death to a Dining Experience? Massachusetts General Hospital, 1846. The first anesthesia. It is over: she is dressed, steps gently and decently down from the table, looks for James; then turning to the surgeon and the students, she curtsies- and in a low, clear voice, begs their pardon if she has behaved ill. The students- all of us- wept like children; the surgeon happed her up. John Brown describing a 19th century mastectomy (taken from The Emperor of All Maladies by Siddhartha Mukherjee). I have 9 toes. I was born with 10 but along the way I lost one due to the complications of frostbite and finally, the surgeon’s knife. There are perks ( cheaper,quicker pedicures ) and drawbacks ( no flip-flops) to the revised me, but I have no regrets. In retrospect, sacrificing a digit was a small price to pay for freedom from for the daily pain of a seemingly incurable osteomyelitis (bone infection). The surgery was uneventful. I walked into the hospital with 10 toes and left with 9. In between I had a pleasant conversation with the surgeon and the anesthesiologist and a really good sleep. I have had other operations in the past and I can say that I have never had a bad experience. Although general anesthesia should never be undertaken unnecessarily, and never should it be employed in Michael Jackson style as a drug for sleep, modern-day anesthesia for the healthy patient is relatively straightforward thanks to better anesthetic agents and the expertise of anesthesiologists. Under such circumstances it is not surprising that the reputation of a 19th century surgeon was built upon the speed of his surgery. In the 1840s Robert Liston ( a distant cousin of my husband) was considered a skilled surgeon because he could perform an amputation in 2 and ½ minutes. For additional speed he would hold his surgical knife between his teeth freeing up both hands for the procedure. As the germ theory of disease would not be recognized until 1865, fifty percent of surgical patients succumbed to postoperative infection and died. 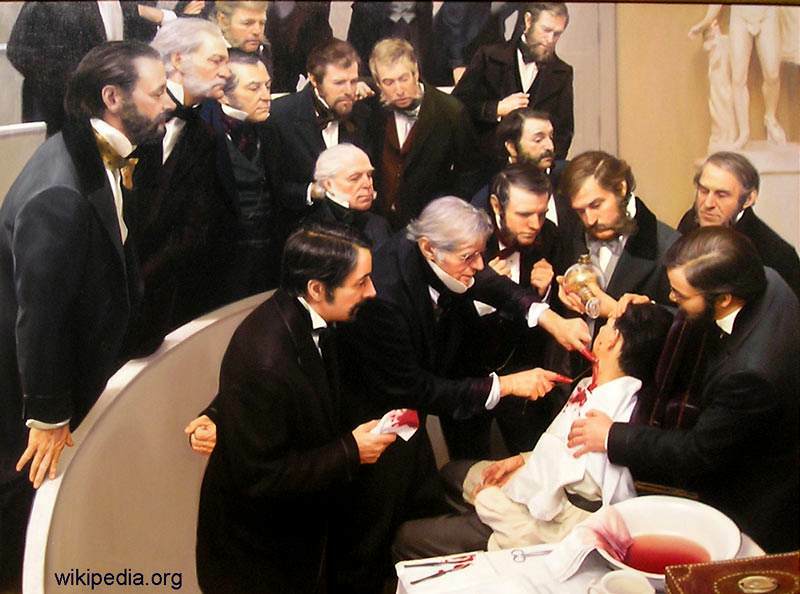 In 1846, an event occurred that would propel the field of surgery into the future. In the packed medical amphitheater of Massachusetts General, a Mr. Gilbert Allen was the ground zero patient for effective anesthesia. While a gallery of surgeons watched, ether rendered him unconscious and amnesic and a lump was swiftly removed from Mr. Allen’s jaw. This historic breakthrough in the field of anesthesia occurred just in time to be made available to the 50,000 men who underwent amputation on the battlefields of the American Civil War (Chloroform was discovered around the same time but tended to cause fatal cardiac rhythms). Surgeries were performed without sterile technique. 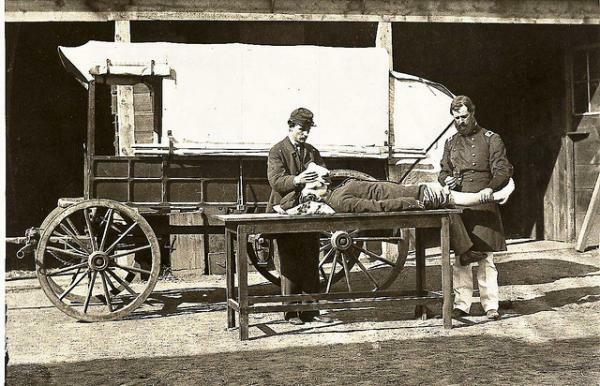 The advancements in anesthesia in the past 167 years are miraculous and the process of going under has gone from a harrowing ordeal to an experience that, for the healthy patient, more resembles a dinner of several courses (albeit a horizontal one). At the risk of being facetious, let me explain. Start by thinking of the OR as the restaurant of choice. A reservation is made beforehand and you are taken to the appropriate table. The experience commences with a starter of oxygen, propafol (induces anesthesia) and rocuronium (paralyzing agent). Feeling a little dry? The IV fluids will help. Then the general anesthesia, desflourane or a similar agent, would be your main course as it keeps you under for the duration of your stay. Having a little discomfort from the surgery? A little analgesic via your IV will help. Any individual needs that arise during your stay will be immediately addressed by staff as you are the only customer. In this restaurant, dessert is included. It comes in the form of the reversal agents, to wake you up. The procedure is over and it’s off to the post op recovery room and time for the staff to prepare the next setting. The whole experience was not to your liking? Relax, you won’t remember a thing but when you are recovered, think of how anesthesia is just one more reason to feel lucky to be living in this time and place.